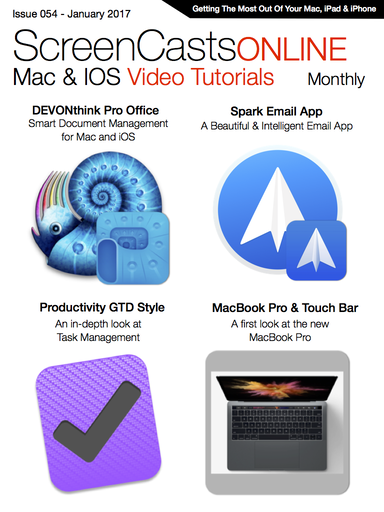 Get a 20% discount on all three editions of DEVONthink (Personal, Pro, Pro Office) as well as the Infoworker's Pro (Office) Bundles by using the discount code below during checkout. DEVONthink looks to be a good possible replacement for Evernote. One function that Evernote has not mentioned so far...maybe the final show...is the ability to set reminders for items (notes) in DEVONthink. Thanks for the comment! Yes that can be done with the scripts found in Devonthink. I hope to be able to add that into the next show as a mention. Thanks for the reminder:). Hi, I'm afraid there's some problems downloading the videos. I've tried several times and I failed every time. Nice tutorial. Would love to see Todd demonstrate a way to create a new item (like a chronology or timeline) that links back to other documents and things in the database. Thanks for the comment Michal! Yes I will be covering the types of Documents you can set up in Devonthink and how to link files together like a wiki which will hopefully cover what you are looking for. Thanks again and have a great week! Will you also teach how to set up sync among iOS and MacOS? Thanks for the comment Sven! Yes I will be covering how to set up sync across your devices and some other ways to access your data remotely! Ember & Pixa - Organise Your Images tutorial is also available to watch in Issue 54 of the ScreenCastsOnline Monthly As a Premium member, this back issue may be available to you for free, or if published before you became a member, is available for individual purchase as a back issue in the ScreenCastsOnline Monthly Mag application.